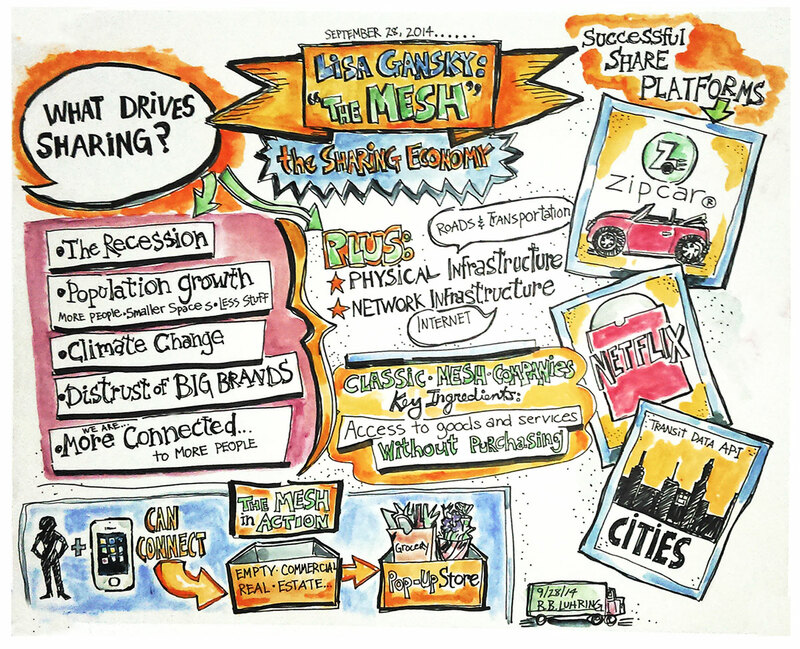 Graphic Recording: Lisa Gansky's Mesh - Your stories. Our drawings. While interacting with the audience Andreas (Gaertner) creates a “wallpaper of knowledge” live on-stage. Lisa Gansky is the author of The Mesh: Why the Future of Business Is Sharing, and the “instigator” behind the Mesh Directory (http://meshing.it). She often speaks on the topic of technology, social currency and business platforms and models. For more than 18 years, Gansky has been an entrepreneur and environmentalist focused on building companies and supporting ventures where there is an opportunity for well-timed disruption and a resounding impact. A founder and CEO of several internet companies, including GNN (the first commercial web publication) and the largest consumer photo sharing and print service, Ofoto (now Kodak Gallery), Gansky’s attention is on sustainable ventures with positive social impact. Gansky currently serves as a Director of Dos Margaritas, an environmental foundation focused in Latin America.